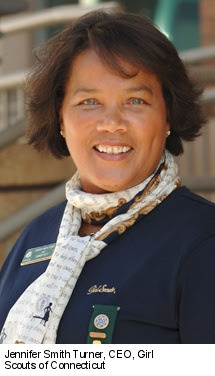 The Hartford Business Journal reports that when Jennifer Smith Turner joined the Girl Scouts of Connecticut as CEO in 2007, she inherited an organization in transition. Under her leadership, the Girl Scouts finalized the realignment of five independent scouting councils into one statewide organization while continuing to grow membership to a record 46,500 girls. As she eyes her June retirement, after nearly 40 years in public service and non-profit work, Smith Turner talked with the Hartford Business Journal about her organization’s future challenges and opportunities, as well what she’s learned from the thousands of girls she’s been honored to serve. "One is the creation of Camp CEO, a special three-night camping experience bringing together our older Girl Scouts and prominent CEOs around the state. It was a terrific experience to bring these groups together to learn from one another. I am also proud of the number of Girl Scouts in Connecticut who have received their Gold Award, the highest and most prestigious award a Girl Scout can earn. More than 240 girls in Connecticut have received their Gold Awards since our incorporation, an enormous percentage of our demographic."